Seller: art-ani (265) 100%, Location: Sofia, Sofia city, Ships to: Worldwide, Item: 202610593845 Very rare ORIGINAL ANTIQUE Ottoman MEDICINE-snuff Hand-wrought silver box with madonna-19th century.Box very rare. Made of Hand-wrought silver alloy. Box has rare art madonna.GUARANTEED 100% GENUINEExtremely beautiful silhouette and shape. 100% super collectible. Box was used for storage of pills, powders,"ENFIE"-snuff or other solid.Approximately: 6.5cm x 5cm x 2cm 2.56 x 1.97 x 0.79" 48.38gr.Excellent used condition!!! Preserved. Normal signs of time and use.NOT Old repair work!! !EXCELLENT PERFECT USED and AUTHENTIC CONDITION! Normal signs of time and use.FOR THE REAL CONDITION OF THE ITEM - Please view CAREFULLY ALL photos! Please be patient and read the entire description of the listing! Items will be shipped out within 1-2 WORKDAYS after payment is received. I ship items with PRIORITY, REGISTERED MAIL, TRACKING NUMBER and so you wouldn’t have to pay additional taxes. My items travel ABOUT: America and Australia 15-20 WORKDAYS. For Europe 7-15 WORKDAYS. Please make sure your shipping PayPal address is correct! I do combine shipping and GOOD discounts. For more than one item please get in touch with me so that I can inform you of the discount. If you are interested I can send more photos,details and measurements. You will receive exactly what you see on the pictures. Please leave feedback after receiving the item and I will always return the favor. If you have further questions, feel free to contact me. Thanks for your interest, your time and your attention. Condition: EXCELLENT PERFECT USED and AUTHENTIC CONDITION! 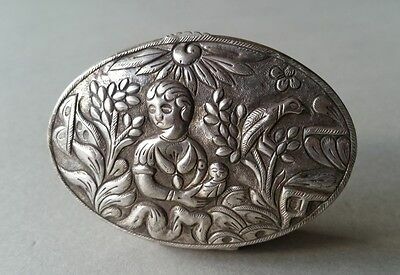 Normal signs of time and use.FOR THE REAL CONDITION OF THE ITEM - Please view CAREFULLY ALL photos!, Material: Ottoman MEDICINE-snuff Hand-wrought silver box, Provenance: OTTOMAN ERA XIX c.
Popularity - 11 views, 0.2 views per day, 57 days on eBay. Good amount of views. 0 sold, 1 available. 11 views, 0.2 views per day, 57 days on eBay. Good amount of views. 0 sold, 1 available.